USAA is the most popular bank for military service members. 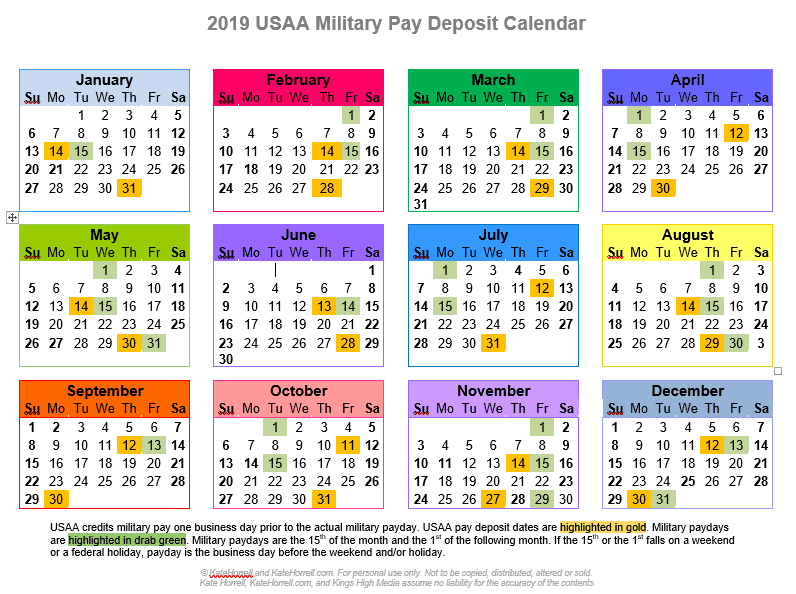 As a benefit to their military customers, USAA credits anticipated military pay one business day prior to the actual payday, provided they receive the pay deposit information from the appropriate finance agency. Click on the image to make it larger, then save it to your computer, and print it. Save the PDF copy and print it. Save the word copy and print it. As always, please let me know if you have any problems with these printables. I can’t fix them if I don’t know what’s wrong! It should be noted that occasionally (rarely – but it does happen), someone in the pay dept. in the military goes home or on vacation without hitting that “send” button and pay doesn’t show up early. It has never ever failed to be posted on the actually military pay date when that happens. But in the last several years I think it has happened 2 or 3 times. Actually happened today. I was surprised when I checked the bank and the pay wasn’t there. I am sure it will be there on Monday. But usually what happens is they scramble at the finance office and say that members won’t allowed to be paid a day early any more. A memo gets sent out. And then next time it is business as usual and the day early pay continues at USAA. 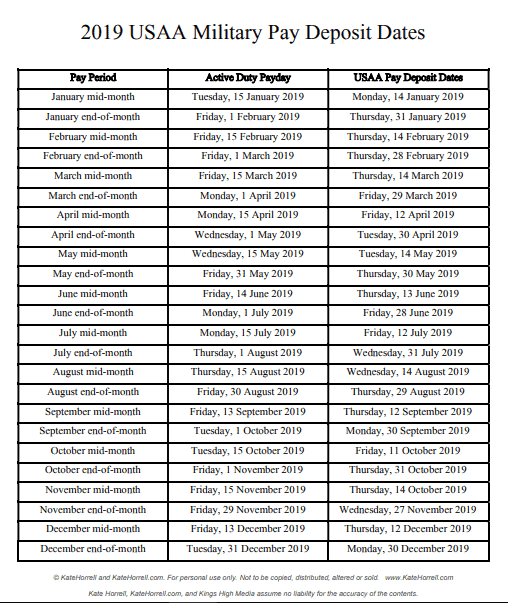 Why we get paid early at USAA (and some other banking institutions) is that the pay department actually sends the payroll out about 24 hours before payday. This is so the banks have it in their coffers to give/release on the correct business day. Most banks hold it until the actual payday (1st/ 15th). But a few (USAA included) have a policy that once they have it – they allow us access to it, citing that it is our money after all. Tiffany, just so you don’t have mis-information: Financial institutions do not receive actual payroll funds in advance of the actual payday. They receive the information regarding the deposit early. The banks that offer early direct deposit are basically making a mini-loan of the funds that they’ll receive in the future. Then the actual pay funds are transferred to the financial institution on the actual payday. It is USAA’s policy to credit military pay funds before payday provided they receive the information from the appropriate finance office. There are times when they do not receive this information in time to process it prior to the actual payday, as you’ve noted. Anissa, have you checked your mid-month net pay advice statement on myPay? You should verify that there is pay due, and that the bank account information is correct. Kaci – thanks for letting me know. Can you tell me where exactly? I’m not seeing it. Thank you! 93 April is the only thing I see wrong. I’d like to say thank you. We are va paid, so our pay follows the active duties 1st of the month pay day. I run all our pay says and how many meals I have to buy based on your calendar, it’s never let me down. Thank you very much. It’s there, look at the charts at the bottom. (Listed chart and color chart.) Also, Go Hawks. Hey! Just mentioning you have June’s mid month payday as June 30th. No pay so far today, July 31. Between summer and vacations, I’ve been counting my pennies to get to today! I really hope they get that pay through. Our First Command allotments were available Friday! Will you be doing 2019 soon? Probably mid-October to early November? Do you need some specific information sooner? No, I was just doing my 6 month budget and was curious. I can wait! Thanks for doing this by the way— it’s VERY helpful! Thank you for doing these! Just printed the 2019 version! Good evening! I have a question about this week. Since we have USAA does that mean we get paid this Friday, Dec 28th? Because everyone else gets paid on the 31st? Since the first and the 31st are considered holidays would we get paid Friday the 28th? Bille, the 31st is not a holiday. Awesome work! Thanks for the dedication making this! It removes alot of awkward phone calls to supervisors for 24/7 shift workers, thanks!! 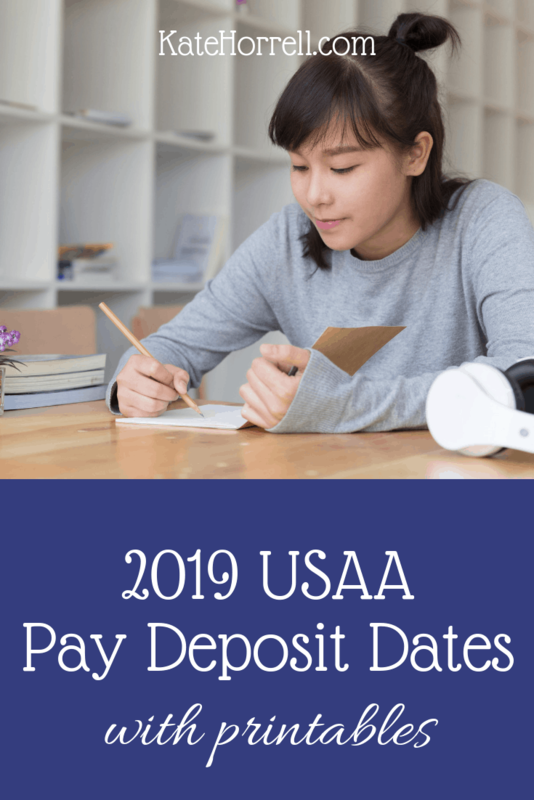 Did you see that the USAA website has March 28th, 2019 as the April 1st pay date? Good morning, have you found out? Obviously it’s the 28th and I don’t have my direct deposit. I’m sure they meant tomorrow, March 29, 2019. Zondra – USAA’s website now says that the early direct deposit day is tomorrow. I hope you weren’t counting on that money! Thank you so much for your quick response. No, I manage my money correctly, thankfully I didn’t need the deposit today. I pretty much knew it had to be the 29th. Or maybe USAA was being generous.. Not!!!! Hi Kate! 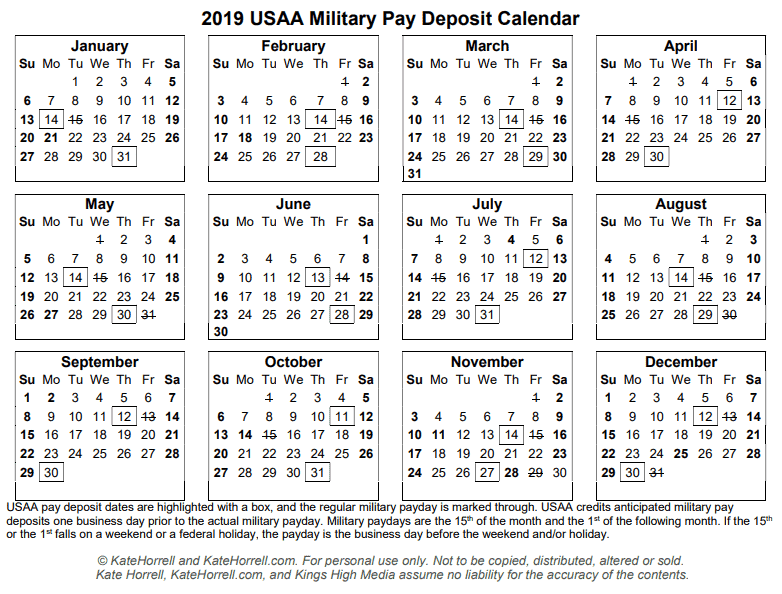 I’m seeing some charts that say March 28th as the USAA day or deposit and others that are the 29th. Could you please clarify which is correct? Thanks so much. Brandon – I just looked at USAA has changed their webpage. The information here is correct. Thanks for asking! Looks like the same issue for April…I’ve seen calendars that say 12 Apr and 13 Apr, which is strange given the latter is a Saturday. Today is the 12th and there was no pay in my account this morning. Hi Rebecca, You’re right – it seems like there was also a mistake on this payday. But rest assured, pay should come in today. It can come at any time across the day. I know people get used to it being deposited early in the day, but that’s not guaranteed and sometimes it doesn’t happen until later. I hope that helps.